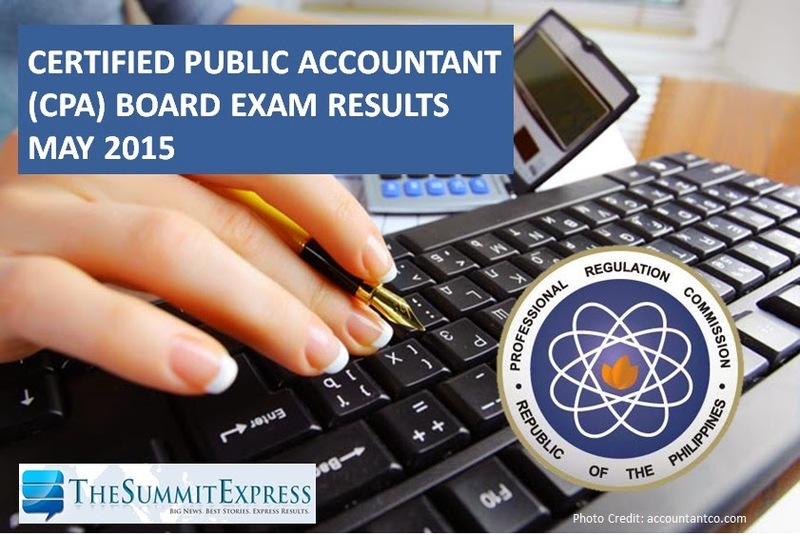 Those awaiting results of May 2015 CPA board exam - Certified Public Accountants licensure examination can find here the full list of passers, top 10, performance of schools and top performing schools as the Professional Regulation Commission (PRC) and the Board of Accountancy (BoA) released results in 3 working days after the exam. PRC on Thursday said that 2,132 out of 5,959 passed the Certified Public Accountant Licensure Examination. The first CPA board exam this year was conducted in the cities of Manila, Baguio, Cagayan de Oro, Cebu, Davao, Iloilo and Legaspi on May 10, 11, 17 and 18. The members of the Board of Accountancy (PRBoA) are Joel L. Tan-Torres, Chairman; Betty C. Siy-Yap, Vice Chairman; Eliseo A. Aurellado and Gerard B. Sanvictores, Members. CPA Board exam covers the following subjects: theory of accounts and auditing theory (Day 1), management services and practical accounting problems I (Day 2), auditing problem and practical accounting problems II (Day 3) and business law and taxation ( Day 4). May 21, 2015 Update: IS THIS THE DAY OF RELEASE ? Three days have lapsed since the last subject of the May 2015 CPA licensure examination. PRC and BoA are now working hard towards the release of the results. In July 2014 examination, results were released in three (3) working days after the last day of examination. A total of 1,107 out of 5,540 passed the board examination. De La Salle University (DLSU) - Manila was named top performing school with 90.67 percent passing rate. In October 2014 CPA licensure exams, PRC also announced results in 3 working days. PRC named 4,123 out of 11,137 examinees who have passed the exam. University of the Philippines (UP) - Diliman and University of Saint Louis - Tuguegarao (USLT) topped the schools with 100 and 86. 76 percent passing rate respectively. Aside from the full results, PRC will also announce the registration schedule for the issuance of Professional Identification Card (ID) and Certificate of Registration. Those who will register are expected to bring the following: duly accomplished Oath Form or Panunumpa ng Propesyonal, current Community Tax Certificate (cedula), 1 piece passport size picture (colored with white background and complete nametag), 2 sets of metered documentary stamps and 1 short brown envelope with name and profession and to pay the Initial Registration Fee of P600 and Annual Registration Fee of P450 for 2015-2018. PRC said: "A Certified Public Accountant shall be considered in the practice of his profession, if the nature and character of his employment whether as an officer or employee in a private enterprise or educational institution involves decision-making requiring professional knowledge in the science of accounting or when he represents his private employer before any government agency on tax matters related to accounting, and such employment or position requires that the holder thereof must be a Certified Public Accountant; or if he holds or is appointed to a position in the accounting occupational group in the government or in government-owned or controlled corporations, including those performing proprietary functions, where a civil service eligibility as a Certified Public Accountant is a prerequisite." TheSummitExpress will update this page for the complete results once out online. Like Us on Facebook or Follow Us on Twitter to receive updates related to Accountancy board exam in the Philippines.